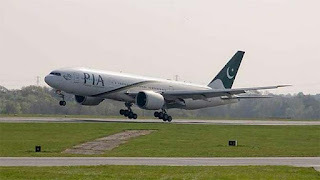 Karachi, May 7 (PTI) Pakistan International Airlines has taken a senior pilot off-duty for allegedly sleeping on a London-bound flight, risking the lives of over 300 passengers on board by handing over the aircraft to a trainee. Captain Amir Akhtar Hashmi had taken a two-and-a-half- hour nap in the business class passenger cabin on April 26 soon after flight PK-785 took off from Islamabad for London, the Dawn reported. The airline was initially reluctant to take action against Hashmi, a former president of the highly influential Pakistan Air Lines Pilots Association (PALPA), but later caved in to "pressure from above". PIA spokesperson Danyal Gilani said that Hashmi was off from flying duty due to the investigation under way, but refused to share any further details. Another first officer, Mohammad Asad Ali, who was under training, was also in the cockpit. Hashmi, an instructor, gets paid over Rs 100,000 each month to train pilots, and was supposed to train Ali Hassan Yazdani during the flight. However, instead of performing his duty, Hashmi went for a quick lie-down, the report said. The flight was carrying over 305 passengers 293 in the economy class and 12 in the club class. The development has surfaced at a time when a top PIA official, facing serious allegations of corruption, left the country yesterday after he was given a special exemption by the Interior Ministry to fly abroad for a month even though his name is still on the country's no-fly list. Bernd Hildenbrand, the suspended CEO of the national flag carrier is under investigation on charges of corruption amounting to billions of rupees. The Federal Investigation Agency is probing the corruption charges against him.